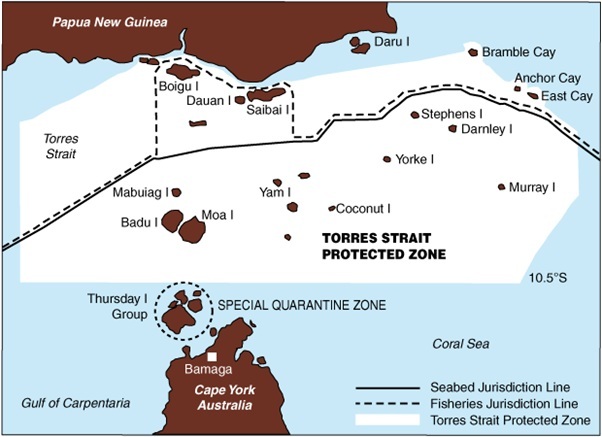 Tuberculosis control in the Torres Strait region: What’s needed and why? The news last week of an extremely drug resistant case of tuberculosis in Cairns (XDR-TB) has once more put a spotlight on the issue of TB control in the Torres Strait region. Papua New Guinea is our closest neighbour. This is nowhere more apparent than in the Torres Strait region, which stretches across the north-east of Australia and the south-west of PNG. From Sabai Island (the northern-most of Australia’s Torres Strait Islands) it is possible to see the cooking fires of PNG villages. Unfortunately, the Papuans of these border villages have starkly disparate lives to Australians living in the Torres Strait. This is despite the fact that the family, cultural and social connections between them is recognised in the Torres Straits Treaty, which allows free movement across the border for residents of the region, and under which border crossings are frequently made. When treatment is delivered under the current conditions which many patients are having, then it’s a matter of months or years before we have forms of TB that cannot be cured. AusAID has since committed to fund an $8 million program over the next four years to strengthen TB control in the region. This includes an isolation ward and capacity for MDR-TB diagnosis and treatment in Daru (the only major town in the South Fly), support to World Vision to train and supervise treatment and support workers in the South Fly, support to Western Province Department of Health to conduct regular outreach clinics by speed boat to these same areas, and provision for one year of MDR-TB second line drugs. go the way of much other development assistance in the region. But this time, instead of clinics that are falling into disrepair in the space of a year, the net outcome of these programs will be the rapid emergence and spread of XDR-TB. Political attention in Australia has focused on the condition of the Daru Hospital, but this misses the real issue. Daru is at least two hours by boat for most PNG villagers who live in the Treaty region, and the cost to travel there and back is equivalent to more than one month’s average income. Conversely, Saibai Health Centre, in the Australia territory of the Torres Strait, is 15 minutes by boat from the South Fly coast, and this trip can be made at a fraction of the cost. Moreover, since most PNG residents of the area travel regularly to Saibai for trading purposes, access to Saibai health services is, in effect, costless. Providing TB treatment through Australian health centres sounds promising, but is not without its risks. Experience has shown that patients may not attend for the duration of their course of treatment, thus leading to the spread of drug resistance. Having health workers based in South Fly villages will help, as will the access provided by a speed boat to bring a doctor. But it is important to understand the complexity of the challenge. MDR-TB is a devastating illness, requiring two years of toxic, complex, costly and often less effective chemotherapy with second line TB drugs. It is not realistic to expect MDR-TB patients to stay in Daru for two years. Nor will the combination of health workers and doctor visits by speed boat be enough to manage MDR-TB. The only viable long term solution is the establishment of fixed clinics in the South Fly. Even this will not be enough. Australia’s health system is one of the best resourced in the world, while PNG’s is one of the poorest and most challenged, particularly in rural areas such as South Fly. The starkly different levels of access to health care for populations living within a few kilometres of each other, and who have daily and ongoing social, economic and cultural exchange, will continue to lead to cross-border health care seeking by PNG nationals. The appropriate role of Australian health centres needs to be carefully considered to prevent the problem of incomplete treatment arising again. We can be sure that only an integrated solution involving the health care systems on both sides of the border will work. Nor can we afford to focus on the South Fly alone. PNG has one of the most serious TB and MDR-TB epidemics in the world. Practical and effective processes for engaging local communities and health workers as partners in TB policy development. Recognition that, in the long term, the only strategy to effectively address care seeking in the cross-border region will be fixed clinics within Treaty villages that support active case detection and management of drug sensitive and MDR-TB. Recognition that support to TB services must be built on strengthening health systems, in particular for primary health care at a village level. Recognition that a strong TB program in the Western Province will only be sustainable if built on a strong national TB program in PNG, with expertise in the delivery of MDR-TB programs. Recognition that there will be a need for health services within Australia to provide care to PNG nationals until the above listed requirements are in place, necessitating service provision on Australian soil for some time yet. Engagement of appropriately experienced implementing partners in the delivery of community-based MDR-TB programs. Independent, ongoing and multi-disciplinary monitoring and evaluation of activities. Many of these recommendations are challenging, but that is precisely the point. No one should assume that the problem of TB, MDR-TB and now XDR-TB transmission from PNG to Australia is easily solved. At least a start has been made, and the issue has a high political profile. But much remains to be done. One thing is for sure: we are in this together and for the long haul, and it will certainly need much more from Australia than $8 million and a four year commitment. Kamalini Lokuge is a Research Fellow and epidemiologist at the National Centre for Epidemiology and Health, ANU. Kebei Salee Koeget is the Local Level Government Ward Member, Sigabadaru, Papua New Guinea, and Deputy Chair, Traditional Inhabitants Committee, Torres Strait Treaty Communities. Anastasios Konstantinos is Director of the Queensland Tuberculosis Control Centre. Will Australia step up in Montreal? Ben, Thanks very much for this positive response, and the additional information you provide. In the interests of accuracy, I would note that the authors don’t talk of “evidence” that the new programs will lead to XDR-TB, but rather point to “threats” that, if not dealt with, might lead to this unfortunate outcome. That’s a very different claim, and not one I think you’d disagree with. TB in PNG and Western Province is one of AusAID’s highest priorities and we welcome the debate on cross-border TB control. AusAID is committed to long term support (10+ years) for TB services in Western Province, including broader support to Western Province’s health system. Our approach is in line with the World Health Organization (WHO) best practice guidelines for TB and addresses many of the issues raised by the authors. These include: the need for long term support to the PNG health system; ensuring access to primary health and appropriate hospital TB services; a strong focus on community engagement in controlling TB; and independent monitoring and evaluation. We have an initial $8.5 million program over four years to support the PNG Government to strengthen control of TB in Western Province and it will continue for as long as necessary. We also support Western Province primary and secondary health care services, essential for TB control, though improving the supply of essential drugs, training health workers and health infrastructure. This includes South Fly communities. We also provide core funding to the Global Fund for AIDs, TB and Malaria (GFATM) for PNG’s national TB program (total program US19 million) and core support to WHO – the global technical lead on TB and other communicable diseases. Our total package of support to PNG health priorities (including HIV) in 2011/12 was $113 million. Other Australian government agencies are responsible for health and TB services within Australia. AusAID’s mandate is to work within PNG borders. We are working to support cross border coordination, oversight and accountability through the Torres Strait Health Issues Committee (HIC). The blog authors note the risks of incomplete TB treatment within Australia, an issue raised by an independent WHO expert assessment in October 2011. WHO plans to undertake a substantive epidemiological risk assessment in September 2012 which will include a specific focus on drug resistant TB cases. There has been real progress and commitment from PNG. AusAID will continue to work closely with the PNG government, WHO and other Australian partners to monitor progress of our support and adjust accordingly. WHO will be undertaking an independent review of the progress of the strengthening of the TB services in the South Fly in November 2012.